Tag Archives for " Insights "
Currently Facebook boasts somewhere in excess of 400 million users and growing. You’ve probably heard this line by now, but If it were a country it would be the third largest in the world behind China and India only. There’s a pretty good bet that some members of your ideal target customer reside in and visit Facebook land, but the trick is to find them. Facebook’s advertising platform is a vehicle worth exploring. 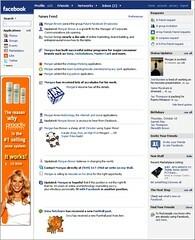 The tool allows you to place small display type ads in the right sidebar of Facebook pages and profiles. At this point it’s not as effective in pure response as well targeted Google AdWords campaigns, but it’s not really the same kind of vehicle and you won’t find AdWords in Facebook, at least for now. To start your campaign you must determine a bid per click and daily budget. You can set both of these numbers very low, but don’t expect much. Initially you are just testing so you’ll want to set your click bid somewhere around the Facebook suggested amount and a daily budget you can live with, something like $50 or more to start. You can always adjust these. Learn about the Facebook Ads Manager here. No matter where or what you should always test your advertising. Online applications like this make it pretty darn simple. You can and should create multiple ad versions. Once you create an ad you will have the ability to create similar ads and run those as well. You’ll be able to easily view which ad is performing the best based on clicks. Facebook does need to approve your ads so make sure you are familiar with their guidelines. The simplest thing to test is your image. I’ve seen ads go from no response to mega response with a better picture. Mind you I had no idea it was a better picture or I would have used it in the first place, but testing told me so. Here are some suggestions from Facebook on improving your ads. Once you create and launch your campaigns you need to start tracking and tweaking. Facebook has a tool that gives you some information on actions taken inside the Facebook platform. So, if you are running an ad for an event or Facebook page you can use the Facebook Insights tool to monitor interaction. Facebook Insights is a nice reporting tool as it can give you information about the actual, not targeted demographics and interests of the people clicking on your ads and keywords that drew that interest. This will help you narrow or broaden your targeting. Page admins can access Insights by logging in and viewing the box titled Insights in the left sidebar. This is only visible to Page admins. If you click on See All you will get full reporting. More information on Insights here and from the very useful blog Inside Facebook. Facebook does allow you to run ads that point people links outside of Facebook and in order to track these ads you simply and monitor them using your own analytics tool such as Google Analytics. If you are using Google Analytics simply use the URL builder tool in Analytics to create a link to your page that contains tracking parameters and place that in your Facebook Ad as the destination link.